"From the smallest jam room to the festival stage to the magic of the studio, Yamaha Drums simply perform on all levels. My PHX, Recording Custom and Maple Absolutes all have such versatility - the shells are amazing and the hardware is second to none." 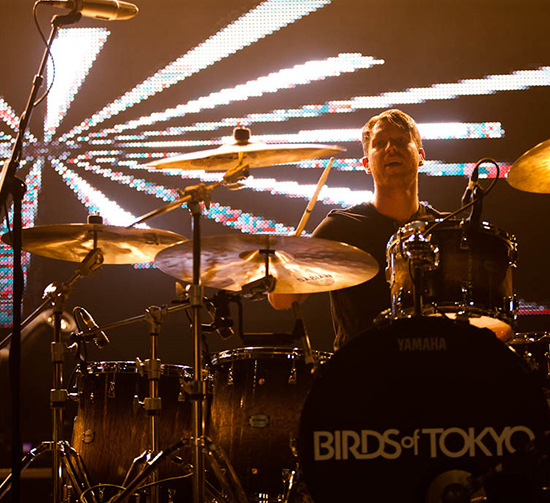 One of the busiest drummers on the scene, Adam Weston and his outfit Birds of Tokyo have undoubtedly made a major impact on Australian audiences and the music industry alike. After picking up the sticks and acquiring his first Yamaha kit in 2000, Adam became a determined and consistent studio and live player through various bands based in Perth. Birds of Tokyo broke through with their debut album Day One (2007), followed by Universes (2008), Broken Strings (live) (2010), Birds of Tokyo (2010) and This Fire EP (2012), picking up a swag of awards with gold and platinum records along the way. A fourth studio album has been announced for a 2013 release with further touring and festival appearances planned. Sons of Rico, another recording and touring band in their own right have released the Orange Skies EP (2007) and Reactions (2010) with a second full length scheduled for a 2013 release.